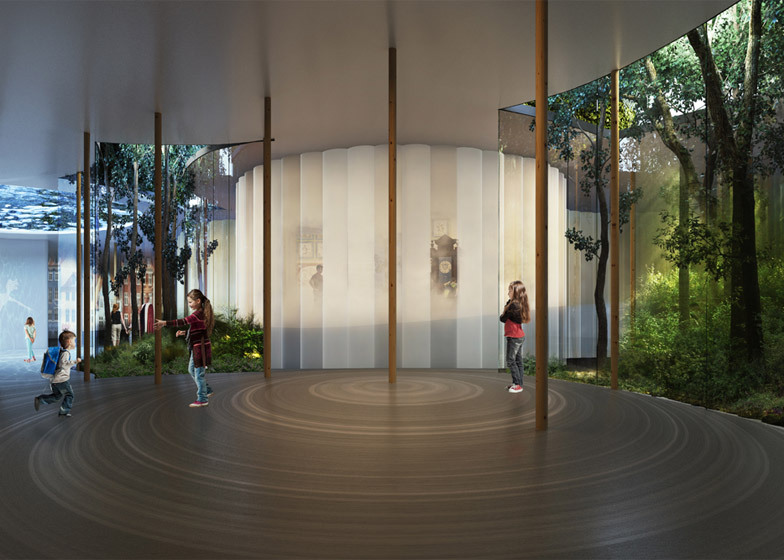 Japanese architect Kengo Kuma has unveiled plans for a new Hans Christian Andersen Museum in the Danish city of Odense, which will revolve around the writer's popular fairy tales (+ slideshow). Kuma's design for the museum features a series of cylindrical volumes with glass and latticed timber facades, and scooped green roofs. The volumes will also provide a new home for Tinderbox, a children's centre that is themed around Andersen's famous fables. 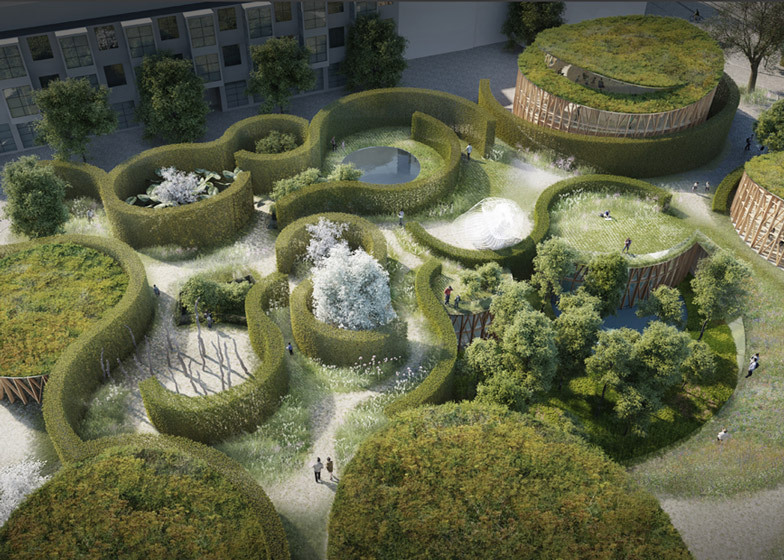 Renderings show the upper floor of the complex surrounded by "enchanted" gardens with large trees, lawns and a circular pond surrounded by a curving box hedge. Tall hedges will also wrap sections of the building. 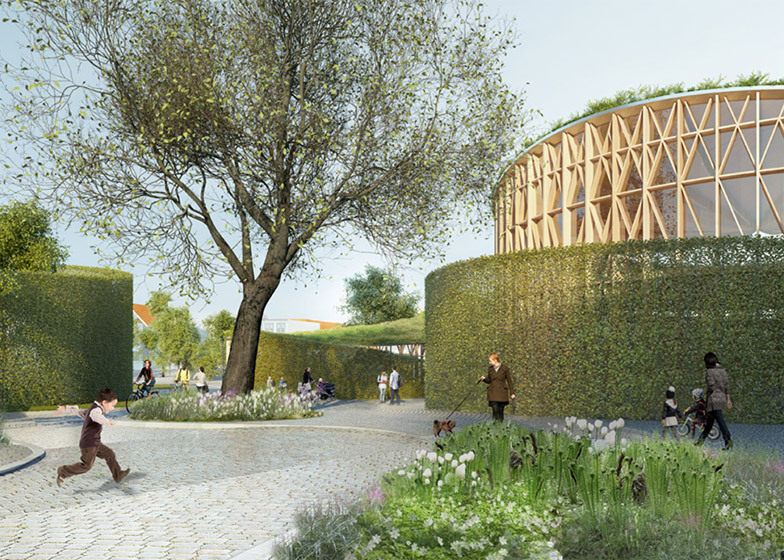 "It was important to us that gardens, building and exhibition design were envisaged as an interconnected whole that clearly captures the spirit of Andersen and brings out the essence of the city of Odense at the same time," said Odense's head of cultural affairs Jane Jegind. Jegind added that the intention of the new design is to move away from the exhibits currently on show at the existing museum, which focus on the author's personal life, and to place greater emphasis on his literary work. An exhibition-design contest for the museum was held prior to the architectural competition, and Kuma's proposal responds to the winning plans by design group Event Communications. Inside one volume, the latticed wall structure cuts through a pool of water with a planted border of giant toadstools and brightly coloured flowers. 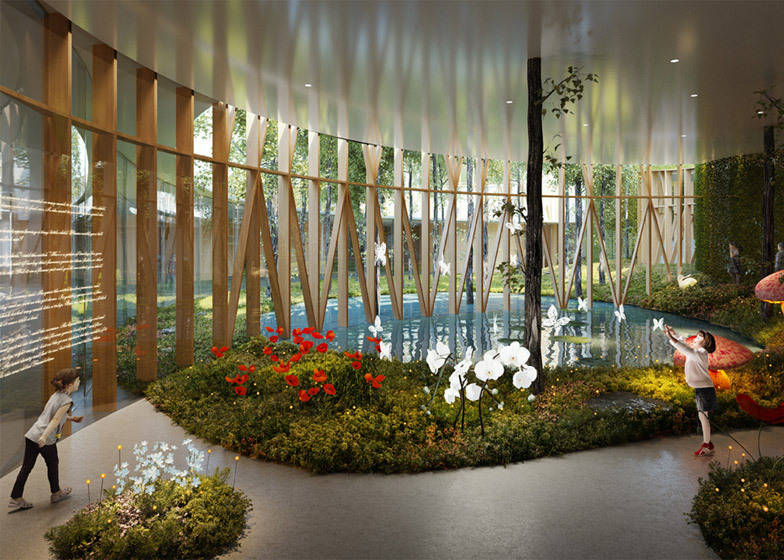 Tree trunk-like columns emerge from the plant beds and channel through the ceiling to give the impression of a forest. Kuma's Tokyo-based firm saw off competition from major firms including Bjarke Ingels' Copenhagen-based firm BIG, Spanish office Barozzi Veiga and Norwegian studio Snøhetta with its design. 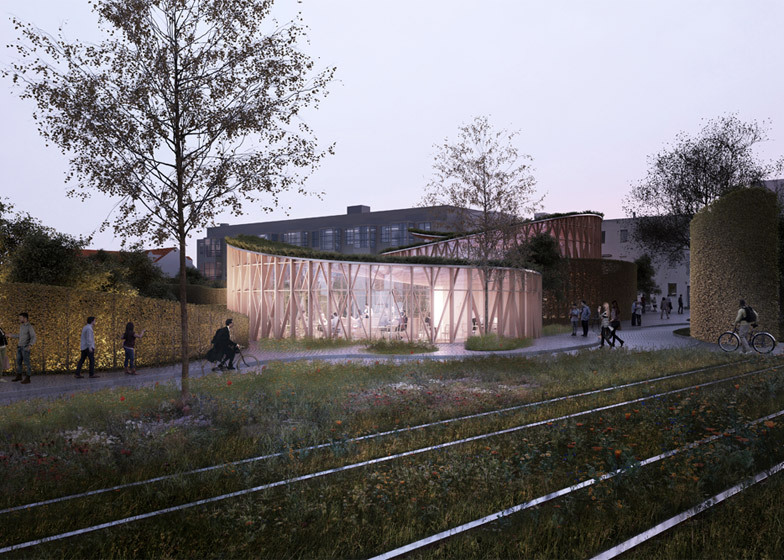 "The fact that Kengo Kuma is from Japan only goes to show that sometimes you have to travel abroad to find home," said Odense mayor and jury member Anker Boye. "The proposal has a unique quality that captures the spirit of both Hans Christian Andersen and Odense, has striking international calibre and is locally embedded at the same time." 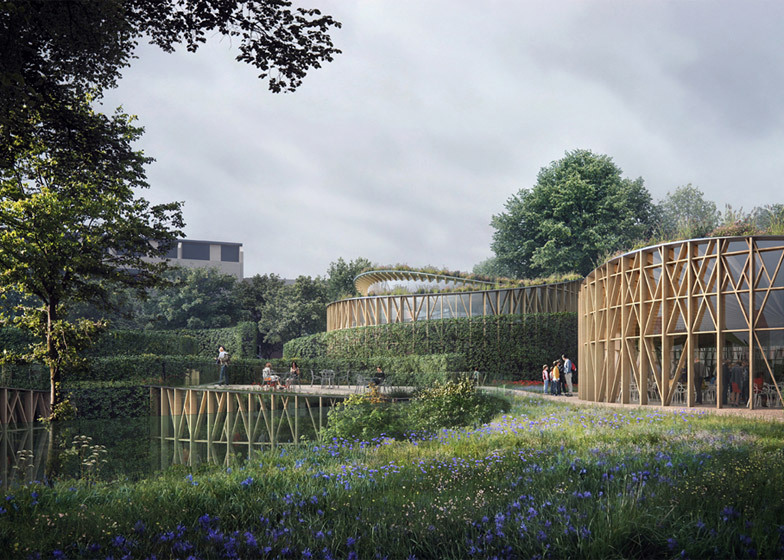 Kuma is working with Danish firms Cornelius+Vöge Architects, MASU Planning Landscape Architects and Eduard Troelsgård Engineers on the project on the plans for the museum, whose unveiling coincided with the 211th anniversary of the writer's birth in the city. Funding is expected to be secured for the project this year, with the building scheduled for completion in 2020 – the same year as the firm's stadium for the Tokyo 2020 Olympics, which it controversially won after a design by Zaha Hadid was scrapped. Other fairy tale-inspired designs include a museum dedicated to the work of the Brothers Grimm by Kada Wittfeld Architektur, and a wedding church shaped like a giant glass slipper. Seattle firm Olson Kundig Architects also recently won a competition to create an architectural fairytale about a dead architect who is resurrected and dropped into a futuristic urban landscape.